Over 100 people attended this free family event. People made 64 bird feeders that they could take home. Local area businesses Keith Brown Building Materials, Corvallis Hardware, Robnetts Hardware and Creative Crafts and Framing donated materials to make the feeders. People also created a stream and had their faces painted with wildlife pictures. Many local agencies and businesses were present to provide information for people interested in enhancing their streamside property. 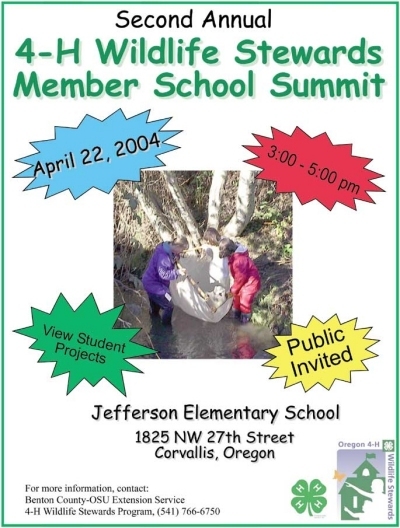 This was a great opportunity for all to learn about the 4-H Wildlife Stewards projects planned for Jefferson students. Jefferson students and community volunteers got together to remove invasive plants; mainly Himalayan blackberry and reed canarygrass. Scout Troop 163 provided a lot of people power and Corvallis Disposal Company provided yard waste bins for hauling off the plants. Over 70 Jefferson students and community volunteers got together to plant hundreds of native trees, shrubs, and herbs. The Oregon Watershed Enhancement Board provided $3,665 worth of native bare root trees and shrubs to use in the plant revegetation work. Scout Troop 163 provided the people power and materials to spread tree chippings on the creek trail as well as install interpretive sign posts. This community event was an opportunity for youth from 10 Benton and Linn County 4-H Wildlife Stewards Member schools to come together in one location to showcase their schoolyard projects. During the day visiting students presented their educational posters to a team of judges, rotated through hands on natural resource learning centers, took a student led tour of the Dixon Creek Restoration project and listened to keynote speaker, Chris Maser, local author and research scientist. Students continued removal of blackberrys, worked on trail maintenance, and spread mulch around the new native plants. One class even chose to give up their recess break to keep working on the site. At Jefferson Elementary, students and community volunteers worked on trail maintenance and potted native tress and shrubs for planting later in the year. 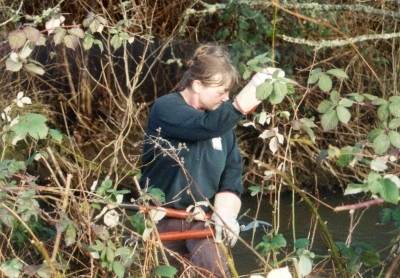 • Summer, 2004 - Many groups helped maintain the wildlife habitat education site along Dixon Creek behind Jefferson this summer. The Corvallis Parks and Recreation Youth Volunteers and the Kiwanis watered and weeded weekly. 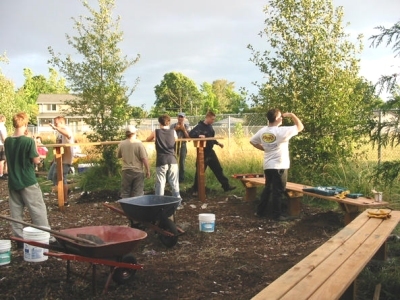 Scout Troop 163 installed a set of benches. Corvallis Public Works provided water for the new plantings and Corvallis Disposal Company provided two yard recycle bins throughout the summer. We will be removing new blackberry growth. Please call Patti Warner, 925-0345 for any questions regarding the 4-H Wildlife Stewards Program.